I, Mary Louise Wanner Andra was born the 5th of March 1901 in Cub River, Idaho. My father is John George Wanner, Jr. and my mother is Regina Nuffer. I have five brothers and one sister, Eva. The oldest were twin boys: William C. and Willard. The other three boys were Golden, Rulon, and Serge. I came sixteen months later after the twins, so Mother had three in diapers. In the fall of 1907 my father was called on a two year mission to Germany because he spoke the German language. We didn’t have much while father was gone, but we were happy. He returned in the fall of 1909 and we moved back to Cub River and in the spring of 1910 we moved to Whitney, Idaho where my father bought an eighty acre irrigated farm and a one-hundred-sixty-nine acre dry farm. This farm was owned by my Grandfather Wanner. My father planted beets, potatoes, grain and hay. He also had a herd of cows and there was plenty to do! Father was very strict and we all had to toe the mark. I remember the twin boys and Golden, just younger than myself, and I had to thin the beets. The first two or three years the mustard weeds were so thick you could hardly see the beets. We kids went to grade school and had to walk three miles. Sometimes we would ride horseback in the winter when the snow was so deep. When it got cold enough to freeze a crust on the snow, we would walk on top and cut through the fields because the snow was above the fences. We sure thought that was a lot of fun. Our farm was just across the road from George Benson and their daughter, Margaret was in the same grade as myself. In the 8th grade, I was chosen to take the part of Snow White in the school play. In school, during the recess, we would jump the rope. There was no one who could turn it fast enough for me. I could outrun all my girl friends. I even used to catch the boys and wash their faces with snow. We also had a girl’s baseball team. We would play Franklin and the surrounding little towns. In the summer after school was out, I would ride horses. I would go up to the dry farm and get the cows. One time I took my little sister, Eva and as we passed a brush, Eva fell off and broke her arm. After I graduated from the 8th grade, I wanted to take sewing course in Logan at the A.C. (Agricultural College). After coaxing my father for several days, he finally decided to let me go. Inez Wallace and I went to Logan on the train. I had been down to Logan for three days when my father came and got me to work on the dry farm, getting the land ready to plant. In 1918, my brother, William C. died in France. He was in the 145th infantry. Three days later, my brother, Golden died in Salt Lake with double leakage of the heart. Soon after, my father sold the farm and we moved to Preston, Idaho. My father bought the Parkinson Farm (4th South and 4th East). Then my father planted beets again and I still had a job of thinning beets. We lived in an old home while my father was having the new one built. In the early fall and winter of 1918, I went around to different homes taking care of the sick. There was a flu epidemic at that time. I was taking care of my cousin, Emma Nelson (George Nelson’s wife). He was a wrestler. Emma died of the flu. In the spring of 1918, I went to work for Roy and Alabell Hull. I cared for the twins, did the washing, ironing, and all the cooking. They had seven in their family and three hired men. At that time I was going with a young man by the name of William Andra. He was born in Germany. While my father was on his mission, he used to go to the Andra home. My father baptized his oldest sister, Frieda. I met William and his mother while living in Whitney. I was still going to school. He and his mother came by train and my father met them at the train. After a few days, William’s mother went back to Salt Lake and William started working for my father on the farm. I guess that is when the romance began. I was 16 years old. While working at the Hull’s, William would come and get me with his new buggy and horse. We would to go Preston to a show. At this time William was working for Jim Bodily. Jim Bodily was the man who bought my father’s farm. I worked all that summer for Roy Hull for $6.00 per week. That fall of 1919, I went to Logan to the County Fair and rode race horses for Joe Perkins. I was offered a job of being a jockey, but I didn’t desire that kind of a career, although I loved to ride horses. In March 1920, William and I were married in the Salt Lake Temple. We made our home in Whitney, Idaho on the Jim Bodily farm (where Lorin Bodily lives, only north in an old house). I even helped thin some of Jim Bodily’s beets. Our closest neighbors were George & Kate Poole. Kate and I spent many hours together sewing. I joined the Relief Society right after I was married. I was asked to lead the singing. Sister Barbara Ballif was the President at the time. We lived there a few months, then we moved to the home where Bishop Morris Poole now lives. My husband quit Bodily’s and he and his brother, Otto thinned beets for different farmers. In the fall, these two would top beets at the sugar factory. I would go out and hitch up the horses in the morning while they ate their breakfast. November 25th, Thanksgiving, our first son was born. My husband thought he had more time before the baby came. He didn’t have the stove put up in the front room. He got all excited and really sweat trying to get that stove up. Will and Laura Dunkley were our closest neighbors. Laura was with me when the baby was born. Dr. Bland delivered the baby. We named him William, Jr.. After William Jr. was about six months old, each Sunday when we went to church, as we got out of the buggy, all the young girls would come running to take little Jr.. They called him the ward baby. Towards fall, we moved again down in the Joe Dunkley home, back of where the store now stands. My husband got the janitor job for the church and the school house. He was getting $30.00 a month and we were paying $18.00 in rent. In the spring of 1922 we moved to Preston on my father’s farm. William helped my father with the crops and after the crops were up, in the fall, we moved to Salt Lake City, out in Sugarhouse. My husband got a job at the Royal Bakery hauling bread to the little adjoining towns. On the 22nd of June 1923 our second child was born. She was an eight month baby, only weighed 4 1/2 pounds. We named her June. Mrs. Hymas came down from Preston to take care of me. Brother LeGrand Richards was the Bishop of Sugarhouse Ward where we lived, so we had him bless our baby. The next fall, my husband’s brother, Walt coaxed him to go into the cafe business at Preston, so we moved back to Preston. They had a good business. In fact, the business picked up after my husband started working there. The young folks as well as the older ones took to him. I didn’t like the cafe business because the children’s father seldom saw the children with their eyes open. William was always used to the outdoors. He was really a farmer at heart. On February 6th, 1925 our third child came along. Another little girl and we named her Mildred. In the fall of the second year in the cafe, my father wanted to sell his farm, and we bought all the land on the south and my brother, Willard bought the land on the north of the road. There wasn’t much money in raising beets, and it was hard for us to make payments on the farm with the interest being so high the first few years. My husband had to do extra work outside the farm work. He dug basements for new homes, hauled sand, gravel, also beets from the beet pile to the sugar factory, any job he could get to make the payments on the farm. On August 5, 1926 another son came along. We named him Golden Rulon after my two brothers. When he was two and a half years old, Golden fell out of a swing and was paralyzed (all of his right side except his arm). At that time we had a Dr. Milford who brought him into the world. For one whole year, every day, except Sunday, I took him to town to Dr. Milford’s for treatment. His office was upstairs in the old Greaves building. On the 27th of May 1928 I had a little red headed girl and we named her Colleen Mary after me. Later on, after a few years, we started to raise peas and the pea crops were real good. One year the peas went to four tons per acre. No farmer beat that crop. I helped in the fields all I could. We couldn’t afford to hire anyone. We didn’t have tractors at that time. This was the year we bought our first car, a Ford. The Doctor said it was too far to walk to town. In the year of 1932 another little blond girl joined our family. We named her Sergene. I guess I wanted her to be a boy so I could name him Serge after my youngest brother who died in New Zealand on a mission. Dr.Orvid Cutler brought her into the world. When she was six months old, they were having a contest at the Grand Theatre for the healthiest baby. Out of one-hundred-ninety babies, little Sergene took the first prize and we were surely proud of her. On July 15, 1933 another son came along. We named him Donald Wanner after my maiden name. Seemed like all the boys had curly hair and they would pass for girls. I had a niece from Downey, Idaho who came to help do the house work. She was crazy about Donald and I heard her say many times that he was the cutest thing this side of heaven. In 1934 I was six and one-half months along, but just didn’t have the strength to carry my baby the nine months. The doctor said he wouldn’t live and for us to give him a name, so we named him Robert Lee. He lived four hours. By this time I was plenty busy with taking care of the children, but the older ones were big enough to help. On the 2nd of December 1936 another son came along. We named him Ross Leslie after Dr. L.V. Merrill. I was also made Relief Society Visiting teacher that year. On the 28th of February 1940 another son joined our family circle and we called him Dale. I used to take these last two little boys, hook the team to the beet puller and put one on each horse. They thought it was fun. My husband would do the hauling, the older boys and girls would do the topping. We all had to get out and work hard. We still didn’t have a tractor at this time, but got one shortly after. My husband used the tractor to harvest the potato crop. In June 1942 another little fellow came along. We named him Dennis Willard, after my brother, and April 9, 1943 our number twelve, a son was born. His name was Larry. When you would see these three little boys in the yard, you could hardly tell which was who, they looked so much alike. William Jr. was in the Spanish American Mission when Dennis was born. Dennis died when three years old. Since this time I was put in as Relief Society Chorister. 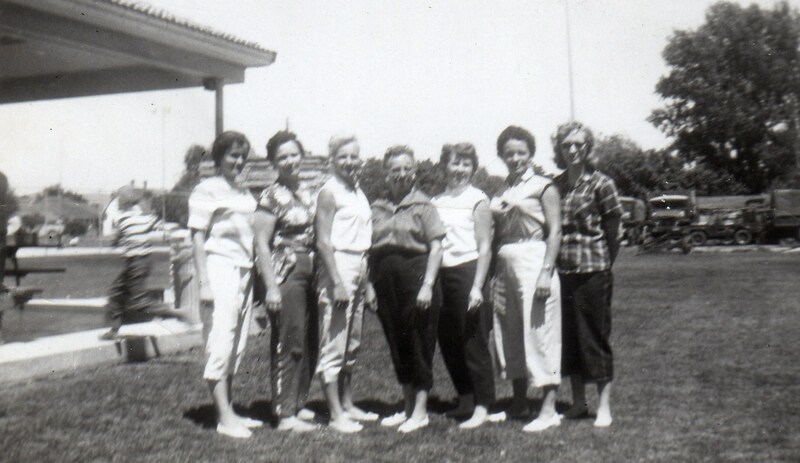 It is 1961 and they have divided the ward and put me in as Secretary of the Young Ladies Mutual. Our second missionary, Ross filled a mission in Brazil and the third son to go on a mission ins in the Western States. His name is Dale and he has one more year to serve. I am proud of my husband, sons, and daughters. This is a story of my life and I would like to pass it on to my posterity. Here is the information on the Andra family. This is the family of whose information I have uploaded. Previously I had loaded the Knauke family album. This will be an extension of that family.